What could be cozier than breakfast in bed? Start the day right with our collection of the best, most elegant breakfast in bed recipes, and celebrate special occasions and holidays with the ones you love most. You don't have to get up early — or get out of your pajamas — to make these delicious breakfast dishes you can enjoy in the comfort of your own home, without none of the hassle of getting dressed and going out. Enjoy a French bistro-style breakfast in the comfort of your jammies with our classic croque madame recipe. 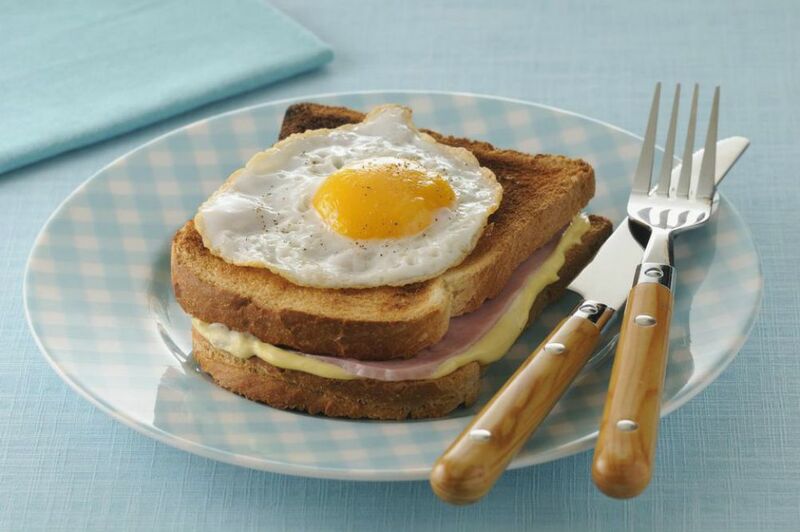 It's a breakfast version of the ham and cheese sandwich, made more substantial with the addition of a scoop of creamy bechamel sauce and a gently fried egg. Eggs benedict is the ultimate indulgent breakfast dish, and we've got a foolproof recipe. Pile lightly poached eggs onto toasted English muffins with thin-sliced ham and hollandaise sauce to make this late-morning favorite. The recipe serves four, but you can easily halve quantities for a romantic breakfast for two. Adding ricotta cheese to the batter makes these gorgeous pancakes so moist and fluffy. Blueberries and lemon add a wonderful sweet-tart flavor. Serve these stacks topped with a lemon icing drizzle for an elegant breakfast that looks as fantastic as it tastes. Fill delicate cinnamon and vanilla-infused crepes with bananas and cinnamon-sugar, and smother in a thick rum sauce for an indulgent breakfast that's the perfect way to treat the one you adore on Valentine's Day. Pile fluffy, perfectly scrambled eggs with fresh snipped chives on top of oven-warmed store-bought croissants for a breakfast dish that's delicious to enjoy, and elegant in its simplicity. Breakfast Grilled Cheese With Scrambled Eggs and Arugula Pesto. Sink your teeth into this savory grilled cheese breakfast sandwich with scrambled eggs and tangy goat cheese, dressed up with a divine arugula-walnut pesto. Add some bacon or ham if you like, for an indulgent diner-style morning meal. Moist strawberry muffins with a crumbly streusel topping are a sweet breakfast treat for Mother's Day or Valentine's Day breakfast trays. The batter includes sour cream, which adds a tangy flavor that highlights the sweetness of the fruit. Serve this savory, cheesy, quiche-style breakfast or brunch pie on Mother's Day, and other special occasions. Smoked salmon, eggs, leeks, Swiss cheese, and fresh dill combine in the tasty filling that bakes in a simple, homemade pastry crust. Flamenco eggs (huevos a la flamenca) are a traditional, oven-baked Spanish breakfast dish featuring eggs, sausage, vegetables, tomato sauce, and breadcrumbs. It packs a ton of savory flavor, and makes a colorful statement on the plate. Serve up dessert for breakfast with this moist, vanilla-scented coffee cake with an irresistible brown sugar cinnamon crumble topping. Feel free to add some chopped walnuts or pecans to the topping, if you crave extra crunch. French toast is fabulous, but it becomes even better when you add Nutella! French toast sandwiches filled with the beloved chocolate-hazelnut spread are a delicious breakfast surprise for Father's Day or holiday mornings. Build excitement for breakfast in bed with the heavenly aroma of cinnamon rolls baking in your oven. Make the dough the night before and bake the rolls in the morning for a special breakfast treat. The easy homemade vanilla glaze is the perfect finishing touch! Treat someone special to an indulgent breakfast in bed, with this fancy recipe for restaurant-style crepes Suzette. Fill lacy, orange-scented crepes with ice cream and fresh fruit, then drizzle with a flambéed orange syrup made with citrusy Grand Marnier liqueur. Making them is a show in itself! Make this scrumptious stuffed French toast casserole the night before for easy baking in the morning. 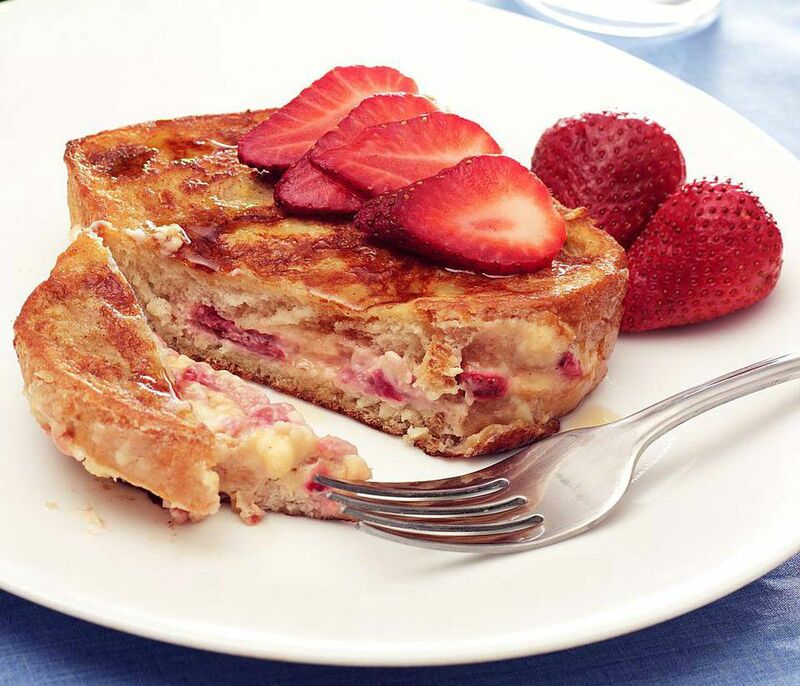 Layer thick slices of French brioche bread with cream cheese, fruit preserves, and dried fruit, then smother in an eggy mixture flavored with cinnamon and brown sugar. Frozen mixed berries are the secret to these super-fruity scones with a zesty sugared glaze. It's easy to bake up a batch of these scones and make breakfast a sweet treat in about 30 minutes. Allow some time for cooling, then drizzle scones with icing. Fluffy, fiber-rich buckwheat and buttermilk waffles get the royal treatment in this indulgent breakfast recipe. Top pancakes with a delicious strawberry-cherry compote, and finish with a sweet yogurt glaze for delicious flair.